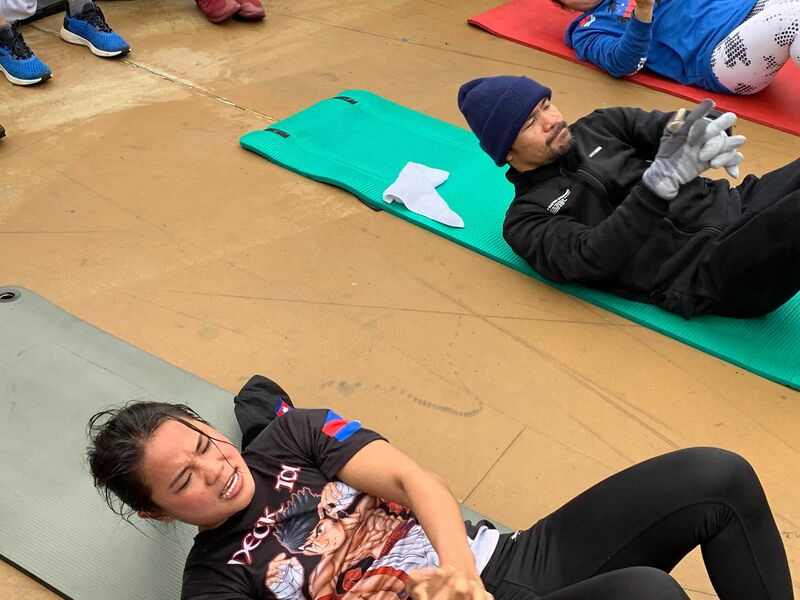 Cambodian MMA Fighter Tharoth Little Frog Sam (Left) and Boxing Legend Manny Pac Man Pacquiao (Right) performing sit-ups at Pan Pacific Park in Los Angeles, California. 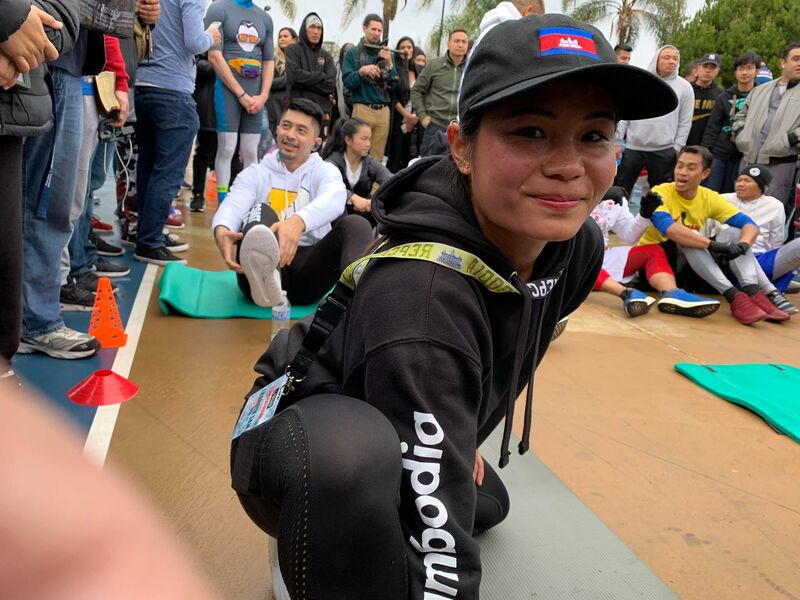 Tharoth Little Frog Sam, a female Mixed Martial Artist (MMA) from Cambodia, had the opportunity to meet and train with the eight-division world champion Filipino boxing professional, Manny Pac Man Pacquiao. Little Frog, 28, is one of two professional female MMA fighters in Cambodia at the time of this writing. During off-season breaks, she dedicates part of her time to acting, playing an active role in First They Killed My Father (2017), Jailbreak (2017) and Surviving Bokator (2018). Having worked with celebrities like Angelina Jolie during the production of First They Killed My Father, Little Frog welcomes herself to a similar feeling upon meeting Manny Pacquiao for the first time on a memorable trip to Los Angeles, California. 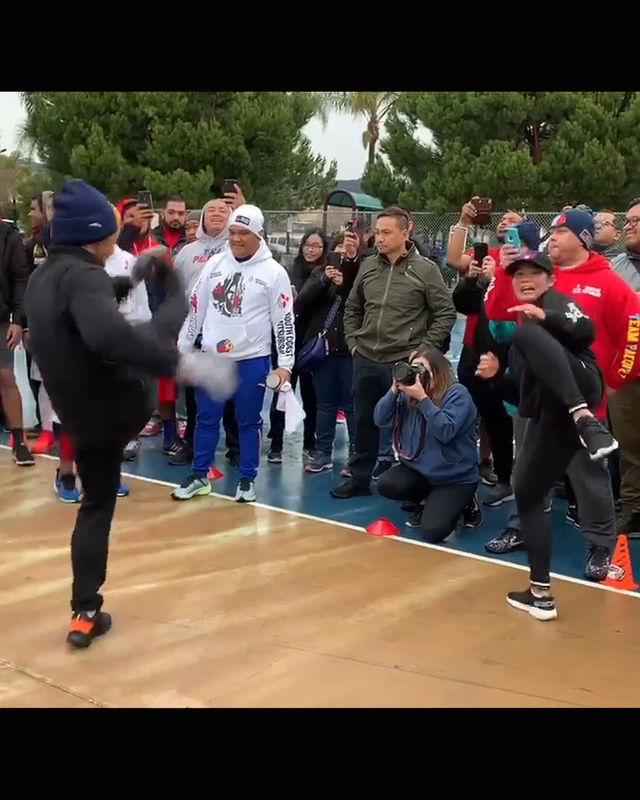 Little Frog is among the select few who is able to train alongside Manny Pacquiao in Los Angeles as he prepares for his upcoming World Boxing Association’s (WBA) Welterweight Championship versus American professional boxer Adrien Broner this coming weekend. On January 12, 2019, it was the eventful day that Little Frog would train alongside one of the most respected athletes in professional boxing entertainment history. It was 5AM. The team met at Manny’s place at his Hancock Park residence. Little Frog was ecstatic and greeted the legend with honor and respect. By 5:30AM, the group began jogging around the neighborhood with fellow staff members and trainees. 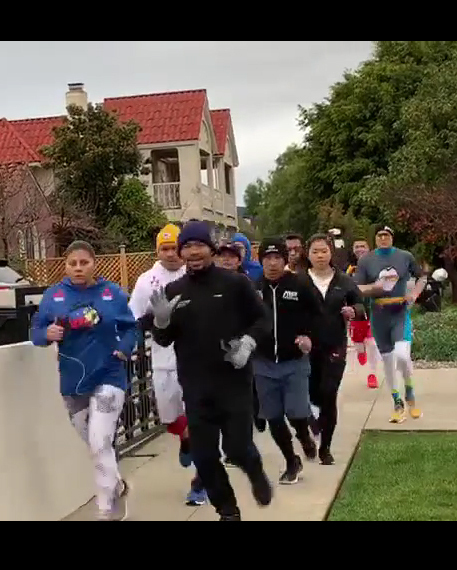 With Pacquiao leading the pack, the group sprints across the streets of Los Angeles towards Pan Pacific Park. Throughout the jog, Little Frog is seen waving the Cambodian flag, crediting her positive spirits in honor of representing her home country of Cambodia. She also accompanied her spiritual wear sporting a black, long-sleeve sweater, stylized with the words ‘REP CAMBODIA’ in white on her right sleeve, a name of a popular clothing brand that dedicates its mission to the expression and cultural movement of Cambodian aesthetics through its apparel line. It is known Manny takes an interest in the country of Cambodia, having visited previously in 2016, where he has met with the President of National Olympic Committee of Cambodia (NOCC) and Minister of Tourism to discuss his participation in attending the 2023 SEA Games. Both Manny and Little Frog share a similar upbringing in their home country, growing-up in poverty while overcoming harsh living conditions by building mental and physical fortitude of a warrior alike. This special bond, shared through the willpower of a fighter, has been a tremendous influence on the advancement of culture and the arts worldwide. 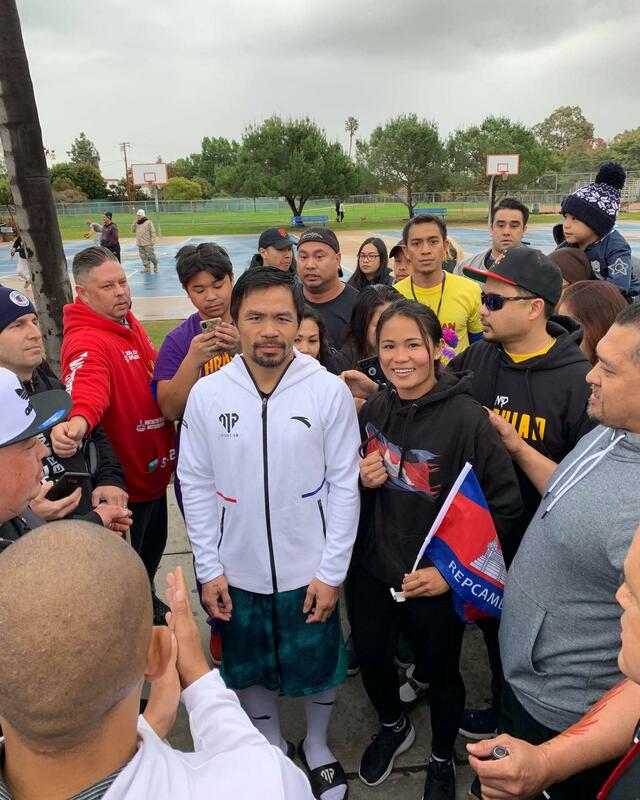 Tharoth Sam and Manny Pacquiao at Pan Pacific Park in Los Angeles, California. Little Frog is a practitioner of Bokator, a traditional Cambodian close-quarter combat fighting style that utilizes heavy elbow and knee strikes among many other hand-to-hand and weapon combat. Bokator is an ancient martial arts that is said to have originated approximately 1,700 years ago in Cambodia. In her contributions to the filming of Surviving Bokator (2018), a 5-year documentary-in-the-making by Director Mark Bochsler and Producer Sandra Leba, Little Frog shares she initially struggled with gender stereotypes from her family during her earlier years. However, she persevered, eventually learning the finesse of the lost art through her Grandmaster San Kim Sean. The ancient sport nearly vanished in Cambodia as a result of the Khmer Rouge genocide in 1975, where many educators, trade professionals, entertainers and skilled practitioners did not survive to instill the teachings to later generations. Then, in the 20th century, institutions were built in an attempt to revive the lost art. 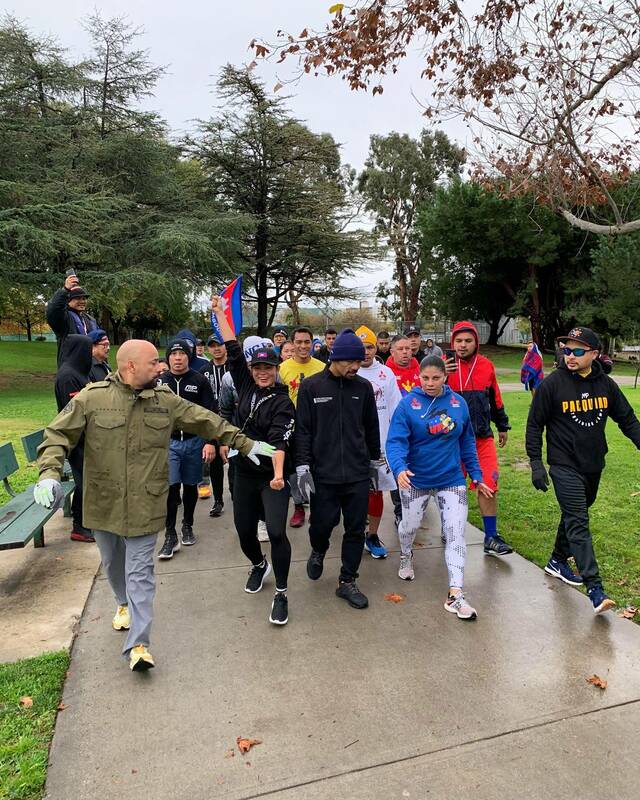 Manny was able to see a glimpse of Bokator in action as the end of the jogging route led the group to a set of stationary mats at the park. Little Frog and other trainees stretching before a strenuous work-out with Pacquiao. The group downsized to three to make room for agile movement within the perimeter. Little Frog and another trainee warmed-up along the sidelines while Manny took center stage. From footwork to shadow boxing, many fans and supporters watched Manny in awe and excitement. Pacing nearby, Little Frog performs an above-the-shoulder heel kick, a signature technique from her Kun Khmer Cambodian kickboxing background. Suddenly, Manny follows Little Frog’s lead. It was an amazing interaction to see. Participants in the crowd familiar with Manny’s southpaw boxing style had never seen anything like it before! After a quick warm-up, the group of three endure a series of intense sit-ups, testing the limits of Little Frog and another fellow trainee. Winded and tired, Little Frog preserved in the name and willpower of her country. A very brief stretching session soon followed with photos, interviews and goodbyes, ending the memorable event in honor and pride. This eventful experience transpired in brief waking moments for Little Frog, who was welcomed by this opportunity by meeting Robert Lyons, a member of A New Day Cambodia, a non-profit organization dedicated to providing shelter, food and education to Cambodia’s impoverished children. Manny has not only been a tremendous influence to people of Cambodia, but also to many worldwide. Since 2016, Manny also serves as a Senate member in the Philippines. Tharoth Little Frog Sam and Cambodia strongly value Manny’s modesty and integrity for being the shining light of faith and empowerment in the world. Manny ‘Pac Man’ Pacquiao will face Adrien ‘The Problem’ Broner this Saturday January 19th, 2019 at the MGM Grand Arena in Las Vegas, Nevada. The fight anticipates thousands of viewers worldwide with a multi-million prize incentive for the winner of the World Boxing Association’s Welterweight Championship. At large, the story of Manny Pacquiao and Tharoth Sam illustrates a pivotal moment for women in Cambodia and their involvement in sports. The humbling and memorable event postulates the question whether Cambodia is receiving enough awareness of Cambodian women in sports to inspire, empower, and create the next generation of leaders for tomorrow’s future. What would happen if there were an increase in the acceptance, availability, and accessibility of sports for women in Cambodia? Perhaps this eventful meeting between these two warriors and the juxtaposition of race, gender, status, and creed closes-in on how close Cambodia really is in breaking through into a New Kingdom.